Our herd is mainly cows and we do extensive ranching. Our cows are Brunes and crossed with Limousin bull. 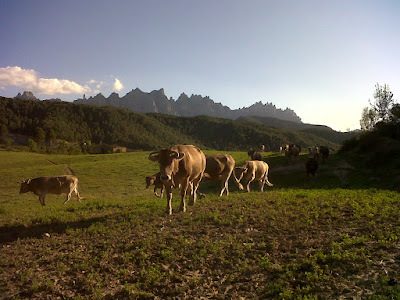 The Cal Sant Miquel livestock farm combines the typically mediterranean forests of Montserrat natural park with forage grass, in which we take particular care about the seeds used and the forage nutrient output. In the process of raising, the calf lives with the mother during the suckling period and it is slaughtered when grown up. So, after a completely natural fattening and bait and an upright and careful slaughter process, we obtain a premium quality meat. We also breed organic black chickens from Penedes: they live in freedom and rest in a mobile chicken coop. We move the henhouse from time to time to make them benefit always the fresh grass and may peck at on the ground for at least three months. The seal of quality and the care of the cattle of Cal Sant Miquel is reinforced through reforestation work that we do, together with the “Department of Environment of the Generalitat de Catalunya”, the association of forest owners' “Entorns de Montserrat” (Currently we are taking part of the “LIFE” project from the CCEE). We also assist with the “Patronat de la Muntanya de Montserrat” for the protection of wildlife. These organizations are the Holiday home Barcelona guarantee commitment about the integration of man with the territory in order to obtain benefits for both parts. Our livestock project belongs to the overall project for the conservation of ecosystems of cal Sant Miquel cottage, your holiday home in Barcelona. You are invited to visit our facilities, upon request. It will be a pleasure to attend you!